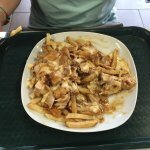 I visited this restaurant on January 9th with a friend of mine, and we were surprised by the quality and the quantity this small newly opened restaurant offered, with Meat, Chicken and Donair Shawarma there was more then enough to mix and match your plate and with a nice smiley face like chef Nawas you could never go wrong!! I even had to tell him at one point to stop filling generously my sandwich or it will explode!! everything I ate including rice, tabouli, and homous was perfectly good and tasty, the variety this restaurant offers fools you when you look at it from outside!! so humble yet so fancy. I would definitely go back there everytime I visit Ottawa. Best of luck to the owners and hopefully we would visit you in other locations. Been to Shawarma Royale? Share your experiences!